Position - Decide which corner the Popup widget appears from. Minimum rating to display - Choose which reviews are displayed on the Popup widget. 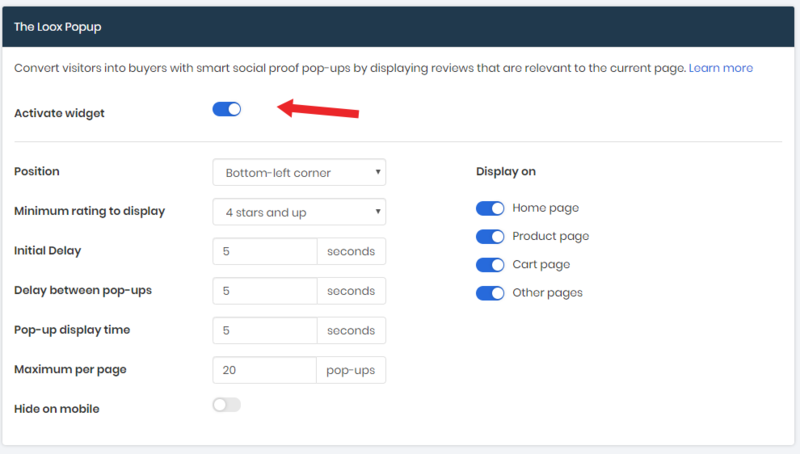 Delay between Pop-ups - Set the time between when a review disappears and a new review appears. Pop-up display time - Set how long the Popup widget displays on the screen before disappearing. Max: Configure the number of reviews that are displayed before the Popup widget stops appearing on the screen. Hide on mobile - Display the Pop-up widget on both Desktop and Mobile or only on Desktop. Display on: Choose which pages the Popup widget will appear. Homepage and other pages - Loox displays all your store's reviews to inspire the customer and direct them to a product page. Product pages and cart - Loox displays the specific product's reviews as to add trust and help convince the customer to buy the specified item.